I have found sometimes when I visit Holy Sites that very close by nature’s spirits have their own earthen chapel that they have created. The first time I noticed this was in a church in the South of France that was built among wild chestnut trees. The chapel itself had been painted like the inside of a wildflower. The walls were painted with petals, stamens and pistils of a flower. The statue of the Virgin Mary looked like a fairy queen. It still is one of my favorite Sacred Sites I have ever visited. But when I went outside the church I found a tree that was directly in alignment with the chapel’s door. 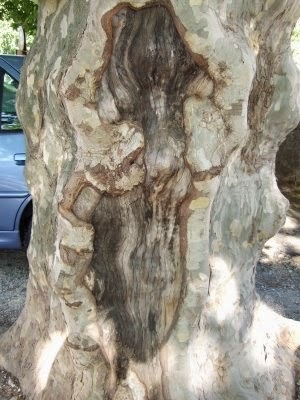 When I looked very closely at this tree I saw a figure of a dancing Black Madonna with the profile of the image of Christ etched in the bark. The elementals took the thought-forms of prayers said within the church and created their expression of worship in the natural setting. When I visited the Chapel of the Holy Cross in Sedona I noticed a very small cleft in the red earth along the walk-way up to the chapel. Many people had thrown coins on the red rocks for well wishing. But as I looked closer at this cleft I realized it was a Shrine of the Nature Spirits. 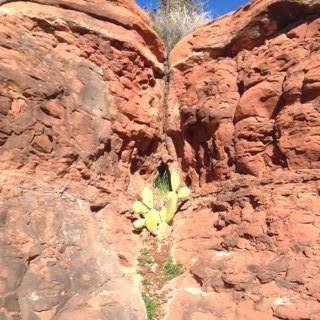 There was at the opening of this earthen chapel a prickly pear cactus…this is a sure sign of protection. The grasses are greener then other places along the route. But is was a natural cross made within the red rocks above the cleft that gave it away for me. This was where the fairy people gathered and worship along side their human species that would pray or mediate at the Shrine of the Holy Cross. When I went back this week I noticed the first desert primroses were blooming below this area….bigger and brighter then most of the flowers in the field. It is always a joy for me to notice such things it brings magic to what may seem ordinary to most people, but with a second look it becomes an enchanted fairyland. Please look closely and you will see a dark vertical line above the grassy cleft in the rock and then you will see a white horizontal line….this is a true fairy cross. The prickly pear guards the opening of the green grassy fairy shrine. You will see a wild haired Black Madonna dancing in the center of the tree to her right is a perfect profile of the face of Christ…There is many faces nature spirits in this photo they are have a grand communion together.